With only some conference title games and the NCAA Selection Show, the Players stood a good chance of matching last year’s stout ratings when Tiger Woods was in contention at the 2018 Players. According to Sports Media Watch with a full weekend sports numbers wrap up, the rating reverted to pre-Tiger for from a 4.2 to a 3.3, with Saturday’s 2.4 down 8%. 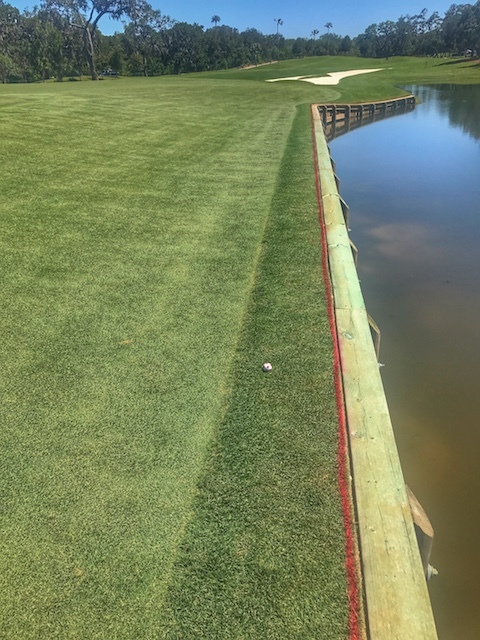 Adam Hayes tried, he really, really tried to talk Jon Rahm out of a 220-yard hooking 8-iron from the 11th hole fairway bunker. It was a pretty startling moment in the 2019 Players final round picked up by NBC’s Emmy-winning audio team and would have to rank with the all-time great player-caddy discussions that will hopefully not haunt Rahm. Yet it’s tough to look at the circumstances, read Rahm’s post-round remarks in this Will Gray GolfChannel.com story, and easily visualize how Rahm’s substandard thinking will hurt his ability to win big events. In the ShotLink era, Jonny Vegas’s absurd putt from the 17th hole’s lower front shelf to the back right location, helping him move to -14 in the 2019 Players, is easily the longest putter ever made there since stats have been kept (2003, Tiger’s better than most putt was in 2001). 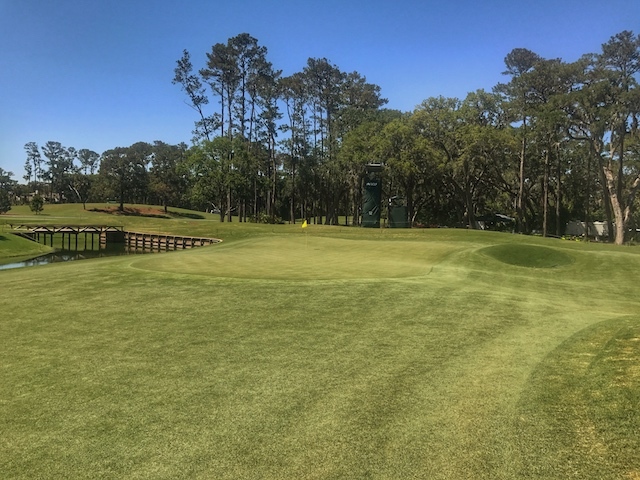 Bermuda On Rye: Attack Of The TPC Sawgrass? 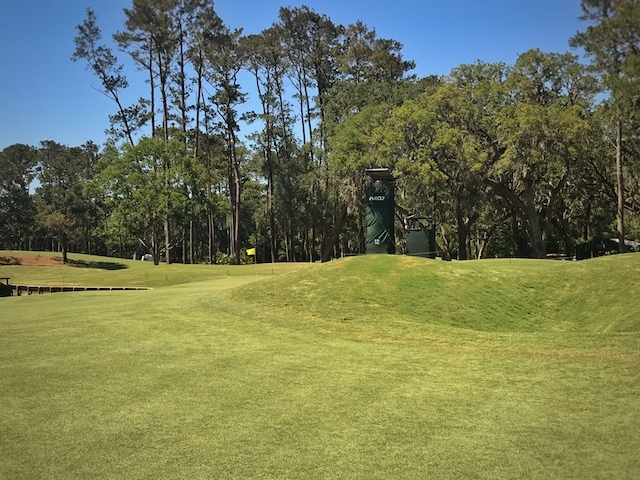 Let’s face it, cautious golf at The Players can be a bit of a snooze, and while I’m all for firm and fast most of the time, the design here lends itself better to aerial golf, encouraging aggressive play and penalizing the overzealous. With the March date’s different winds and softer ground, it seems like we will see more drivers, more risk taking and a little more fun to the proceedings. My story for Golfweek on this and the possible dent this may put in the hopes of plodders. I think you're definitely going to have to have a few more drivers in hand. Going back to your question, I think it was, I hit driver, 6-iron into 7 yesterday. And I've hit 3-iron and 9-iron off that hole. So you can't hit 5- and 4-iron out of this rough and you can't play it the way you used to. You've got to be more aggressive. With it being soft it kind of widens the fairways a little bit, the ball isn't going to roll as much, so I think it definitely plays into the longer hitters' hands and you can definitely have driver out quite a bit more. Players: Will The Flyer Lie Make A Comeback? 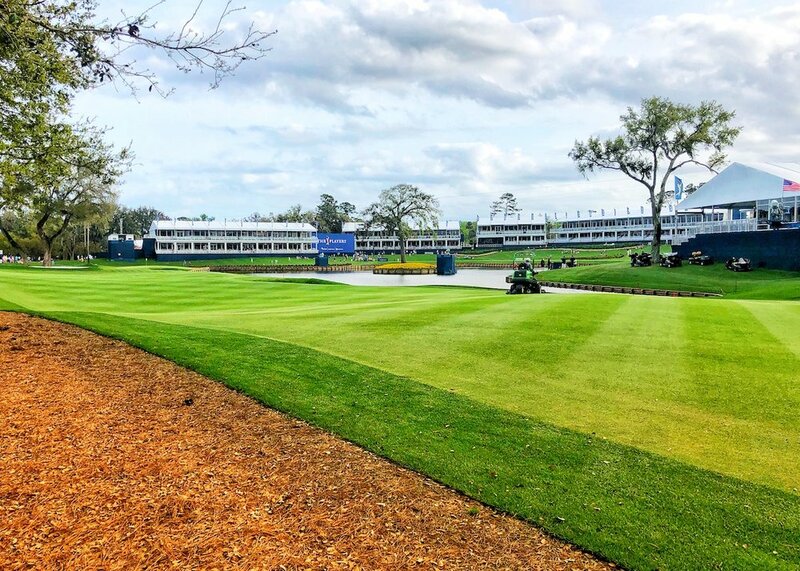 I’m not sure how exactly players will react to the 2.5 inch ryegrass overseed, but after surveying the rough at TPC Sawgrass Monday, I explain the possibilities here for Golfweek. So while the rough may be playing shorter and less problematic—in theory—the design here could punish the excessively aggressive. Personally, I miss the flyer lie in golf and hope it makes a nice comeback here at The Players. Either way, anything but hack-out rough will suffice. 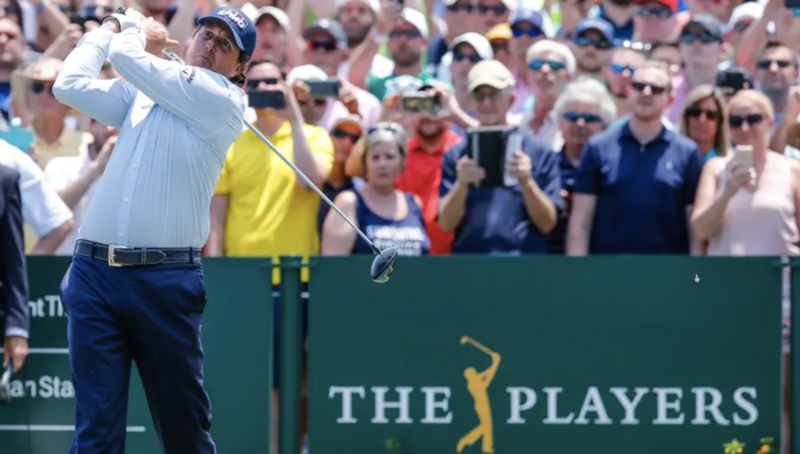 Next week’s Players Championship marks a return to March and a tradition unlike any other: PGA Tour execs trying lots of new things instead of just letting a great tournament be a great tournament. So, we have a new trophy that appears to be an upgrade, but in a world where it’s hard to establish theme music, the stellar Players theme is out. That music, a movie score hybrid from the excellent Man From Snowy River, as Jeremy Schilling discovered, did what you hoped: reminded you of The Players, didn’t annoy you and even added to the proceedings. While the new theme or the reason behind it is not clear—tired of paying Bruce Rowland royalties?—it appears no expense was spared in documenting the recording of this important moment in golf history. Is that ... THE PLAYERS music? Poking around Google News, I found one story from the last four years wondering about possible major status for The Players Championship. Or, as we knew it many years ago before seemingly disappearing from all known radar screens: the fifth major debate. Today's resurfacing was the first I've seen or heard outside of Monday's Live From segment devoted to whether golf's Grand Slam should expand by one. Both Brandel Chamblee and David Duval declared the event a major (already), while Frank Nobilo was the dissenting vote over the course of nine minutes. This debate seemingly died several years ago from fatigue and almost no demand for major status. The tournament has never actively campaigned for the status and in recent years, millions have been poured into improving the fan experience and course. Furthermore, when The Players moved to May it gained an enhanced, stand-alone identity that will carry over to a new, one-week earlier March date. Perks were added for the winner, including a huge purse. The World Golf Hall of Fame now gives Players wins special recognition. It is one of the most prestigious titles in golf. And as the LPGA's Evian event has learned the hard way, forcing major status can actually do damage. Which is why I argued on today's Morning Drive with Damon Hack and Eamon Lynch, that even suggesting this is a major undermines the case that could be made some day for a major new place in the record books. With millions impacted in various ways by hurricane Irma, the status of golf courses is pretty far down the list of priorities. Nonetheless, with the huge hit to Jacksonville, the TPC Sawgrass is on many minds. No photos have emerged--just a fake from a few years ago as noted by Joel Beall and Alex Myers at GolfDigest.com--but in two items Garry Smits has updates on Jacksonville golf. Alice Dye Slams New TPC Sawgrass 12th: "It doesn’t fit the course." 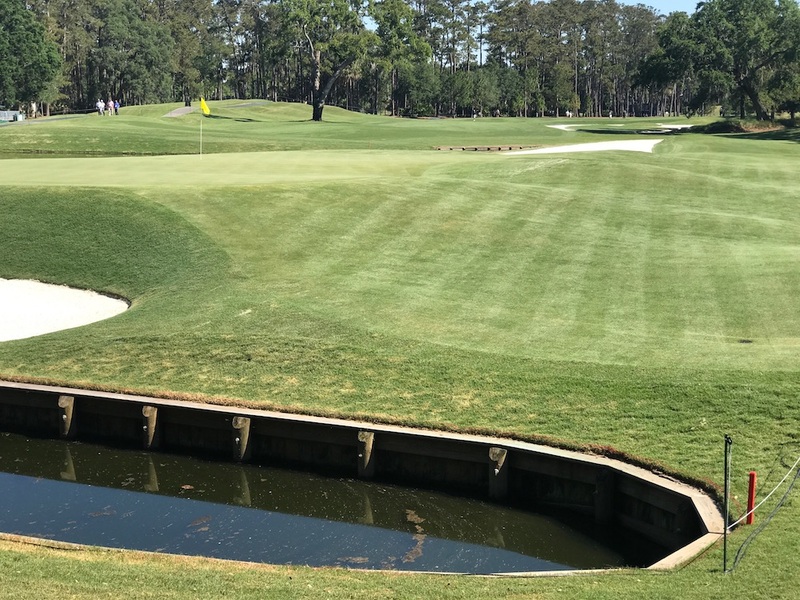 I've been mulling the new 12th at TPC Sawgrass in the aftermath of this year's Players and in thinking back to the golf I watched out there, my admiration for its intricacies has grown. Did it achieve perfection on the first attempt? No. But few of the great short par-4s were perfect from the get-go. Shoot, Riviera's 10th only ascended to its current place atop most lists when technology (and all of that core work) allowed more players to go for the green. Did the new 12th achieve the goal of adding intrigue to the early back nine holes and some much needed nuance at what was previously not a good hole? Did it take one of the most one-dimensional, unimaginative and strange short par-4s on a great course and improve it? The Dyes, apparently, do not agree. Tom Weiskopf also chimed in from afar with some astute and bizarre remarks. I believe had they watched some of the golf in person and witnessed the strategy sessions at the tee box, or have seen some of the player shotmaking that the hole elicited, they might judge the new 12th less harshly. Matt Ginella writing for GolfAdvisor.com quotes Alice, who watched much of the coverage and came away unimpressed. "It’s an awkward hole," says Alice Dye. "It doesn’t fit the course. He OK’d it, but it’s not a Pete Dye design." But many would counter that as much as we love a good Pete Dye design, interesting short par-4s are not of interest to him. Even Alice confirmed this. "Pete has never believed in drivable par 4s," says Alice. "If a player is supposed to reach the green from the tee and you’re always allowed two putts, well, that’s a par 3." Alice, who watched the tournament with Pete all week, on a course that is one of the most iconic of the Dye’s 100-course portfolio, was not impressed with the new 12th. "Even for the players who laid up, they were left with an awkward shot to a target that was angled across their body, the pins were hidden and weren’t accessible and the green sloped away from them, towards the water. The players who laid up weren’t able to be on the offensive. Either TV didn’t do a good job of presenting it or the hole didn’t create the excitement or the drama they were hoping for." Actually, the visibility issues were for those who played back in the fairway. Those who sneaked their lay-ups closer to the green got better views, a great nuance to the hole that developed as players got to know the features better. As for any issues, I think there are two small tweaks that would encourage more aggressiveness without turning it into the automatic-driving situation that Alice laments: keep the lake bank at a higher cut and flip the tee over to the left so that the angle better fits the right-hander's draw-show eye. Currently the players are hitting across themselves a bit. The angle probably accentuates the narrowness of the hole opening and the lefthand lake bank that was declared too severe by many. A move of the tee so that the hole to set it up more like a long Redan could mean more enticement to attack. But to suggest the hole was a failure is to look past the intrigue, interest, variety and skill sets the new 12th hole introduced. The leaderboard's lack of star power was expected to hurt ratings and it delivered! Paulsen at SportsMediaWatch.com points out the good news first: Si Woo Kim's 2017 Players win was the second best PGA Tour overnight rating of the year. Unfortunately it's a year that has seen a ratings decline, with this year's Players the lowest (2.6) since a rain delayed 2005. Final round coverage of the PGA Tour Players Championship earned a 2.6 overnight rating on NBC Sunday afternoon, down 16% from last year (3.1), down a third from 2015 (3.9), and tied as the tournament’s lowest Sunday overnight since at least 1998. It ranked second for the weekend among sporting events behind Game 1 of the NBA Western Conference Finals on ABC (5.6). Because Brandel Chamblee can be a divisive figure, discussion based off of his post-2017 Players commentary seems like a kneejerk reaction to the person making the remarks instead of the substance of his point. There is also the precariousness of making your case off the back of someone like Si Woo Kim who won the tournament fair and square, with clutch scrambling and little choking. But Brandel's "distance constrictions" commentary should not be thrown out simply because you don't care for Brandel's style or views on other topics. Golf can point to a long list of famous tournaments where driver and aggressive play at select times gets taken out of player hands. More often than not, those events have produced awkward finishes with the best scrambler winning. While scrambling is an art that has been mastered by some of the greats, the best courses and setups do the least amount of discriminating against playing styles. Throughout much of the game's tournament history, the ability to use driver to great effect has differentiated the elite players (stars) from the merely great. Tournaments where players can attack at key moments deliver a different energy. But when there is the sense that constrictions are in place--either accidentally or intentionally--the audience and the actors sense something is amiss. Before the 2017 Players, I wrote about the sense that less severe rough, more short grass around the greens and the inclusion of a new drivable 12th would reduce some of the course's tendency to constrict and stifle talent. But the brutal, varied winds conspired with the firm, fast and immaculate conditions to present the fastest TPC Sawgrass imaginable. With that speed, the corridors played narrower and the distance advantage was lost. Without the option to extend some holes, the constrictions played more of a role than is ideal. Again, this does not take away from Si Woo Kim's win. He posted the lowest score and perhaps played TPC Sawgrass more fearlessly because he wasn't saddled by baggage that those with longer histories there cope with. But given that this is one of golf's most significant championships with significant investments made in making it the best venue possible, a little lengthening would go a long way towards ensuring that The Players is constriction-free. Fast times at Ponte Vedra High! **Chamblee says he blocked Poulter years ago in a reply to someone. I genuinely believe we're going to see a little more aggression, a little more creativity and more Players Championship energy thanks to some fun course setup and design tweaks. All without disrupting the fundamental character of TPC Sawgrass. We'll know early on with PGA Tour Live coverage beginning at 7:30 am ET and going until, gulp 7 p.m. PGA Tour Live Coverage of the 12th and 17th holes begins at 9 am. Live From THE PLAYERS 9 a.m.-1 p.m. THE PLAYERS Championship (Round 1) 1-7 p.m. Golf Central Live From THE PLAYERS 7-9 p.m.
Sergio Garcia was in fine spirits as he looks to win a second Players, writes Jeff Babineau. And as Ryan Lavner notes for GolfChannel.com, Garcia has a different caddie for a few weeks and he's a former European Tour winner. Oh, and he and Padraig are still fine. Jason Day fans will want to read John Turner's Golfweek investigation of why there have been no back-to-back winners here. 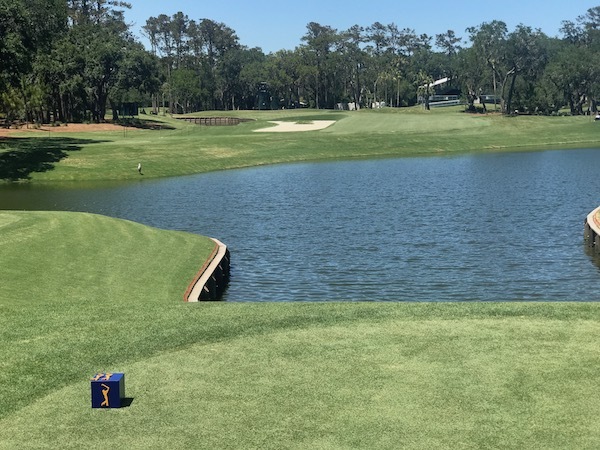 I believe the overall effect of changes at TPC Sawgrass--both manmade and Hurricane induced--will make for a livelier, better golf tournament, as I detailed here for Golfweek.com. While No. 12 is getting all of the attention--players are saying it's too much risk and not enough reward reports Golfweek's Jeff Babineau--it's the short grass around greens and lighter rough that should induce a little more aggression and creativity. Here's a prime example at No. 11 where one pot bunker remains, but the area is otherwise all tight turf. It's tad over-shaped in my view, but instead of thick-rough-covered mounds that had as much as 3 inches in recent years, the player may now be more enticed to go at the green because of the tight turf. Now on to the 12th, where the Groupthink mentality of players and caddies has declared this an automatic lay-up hole. I'm pretty certain by Sunday that this will not have been an automatic layup hole and in fact, a pretty interesting risk-reward hole. A few things to look for, starting with the view just above the tee (a prime spectator spot btw). The layup area is pretty distinct and notice the lower elevation of that area, which sets up an obstructed view approach shot. The view from the layup shows how much the TPC Sawgrass mounding impairs the view. Here's the reward for those who carry the fairway bunker about 270 off the tee. The TV tower rear view shows off the tight mow that leads to the lake. Lots of griping about the slope so far, but I think we need to wait and see. The photo here doesn't show it, but there are two rear and right upslope bumps reminiscent of old Donald Ross greens (nice touch!). You'll hear about the new 12th, revamped 6th and 7th, a new entrance drive and revitalized driving range at next week's Players Championship. But to get a good for feel for those changes and to see things presented in new, fun ways, check out this PGATour.com feature from Sean Martin and the photo/video team in Ponte Vedra. After seeing all of this, the new grass lawn effect to the first tee struck me as the most interesting for players. The overall effort seems to be a simplication and toning down of some bombast, but obviously most of the attention will be given to the new risk-reward 12th replacing the old risk-risk 12th. Jason Day and others also contribute thoughts to the package.